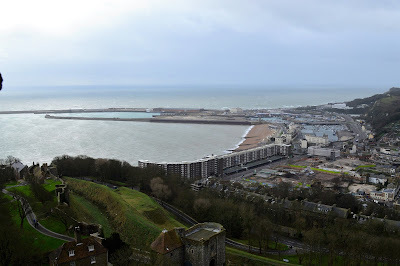 Continuing my series on overlooked places in East Kent, today I'm turning my attention to Dover. Hold on a minute. We all know Dover, right? White cliffs. Ferries to and from France. But when you were taking one of those ferries, did you ever stop and look around the town itself? If you look closely, you can see the French coastline. 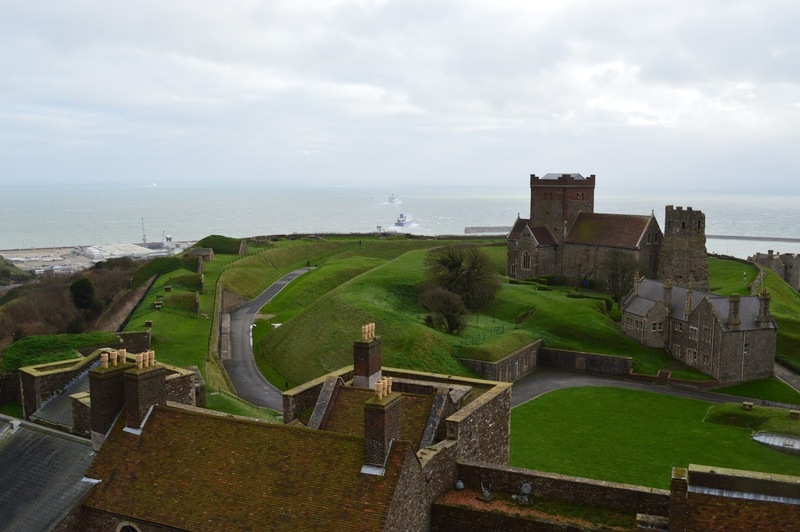 Have you visited Dover Castle? 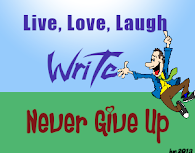 Even if you have, visit again. Because it seems that every time I go, I discover something different that leaves me wondering if it was always there, or if it's part of a new exhibit. 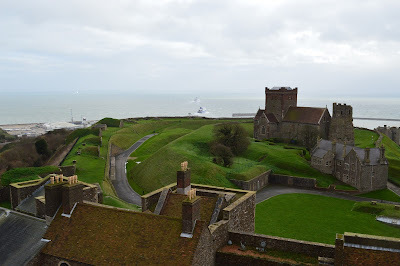 We visited Dover Castle on a rather windy January 2. Luckily, we arrived late morning, still in time to go to the top of the keep. Warning signs were posted that it would be closed if there were high winds, and it did indeed close shortly after we came back down. 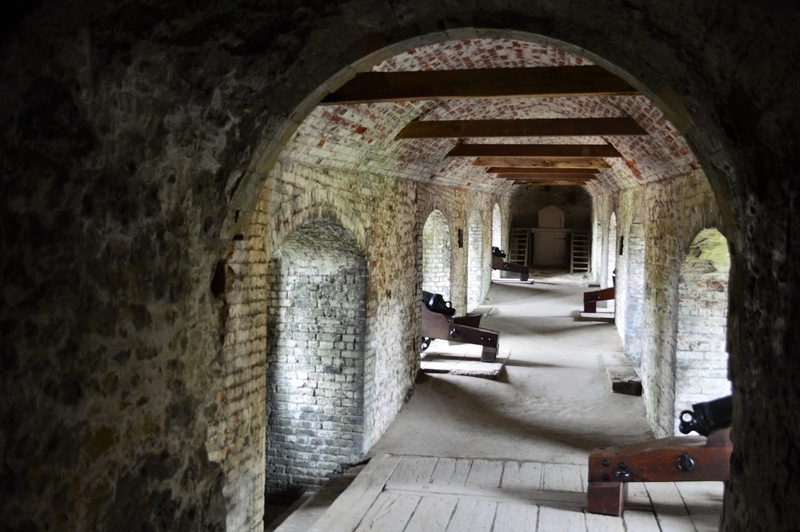 Always a popular attraction, Dover Castle gained new attention when they opened the secret wartime tunnels to the public. Dug into the famous white cliffs is a complex labyrinth of offices, a military control center, hospital, and so on, all of which played a key part in keeping Britain safe during World War II. 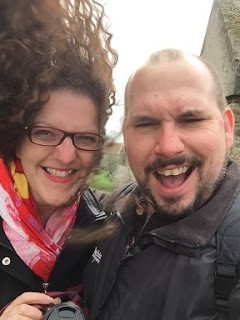 We didn't go into the tunnels on our recent trip due to lengthy waiting times outside in freezing rain, but I do recommend them. Even if you skip those tunnels, there are others to explore. Another series of tunnels, built during a siege in the 13th century, were later used as an underground barracks during the Napoleonic wars. Cannons still guard the defenses, although now all you see outside are rare-breed sheep. Tunnels aside, let's start at the main keep of the castle. After climbing to the top for some windswept views across Dover and the English Channel, work your way back down through the exhibits in the Great Tower. 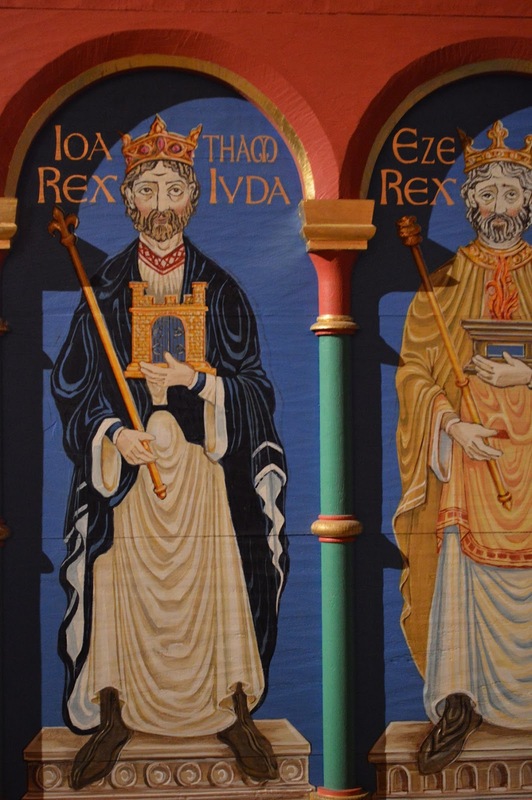 It was built by Henry II, husband to Eleanor of Aquitaine, father of Richard the Lionheart and Bad King John. He is perhaps best known in Kent though as the man whose alleged complaint: "Who will rid me of this troublesome priest?" led to the murder of Archbishop Thomas Becket in Canterbury Cathedral. 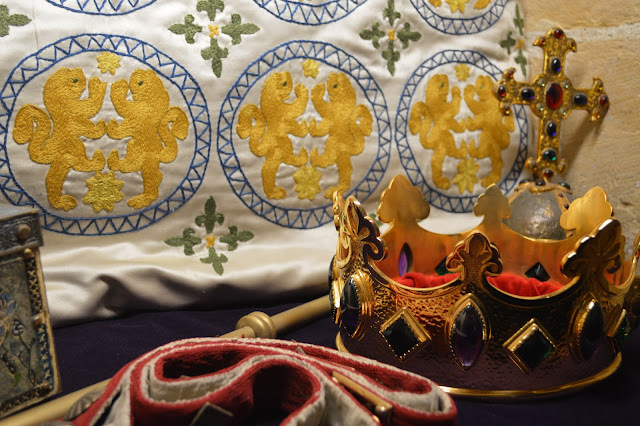 Craftsmen have carefully recreated the kitchens, dining rooms, and royal bedchambers, and visitors who envision castles as cold, dull places to live will no doubt be surprised by the rich tapestries and bright colors. 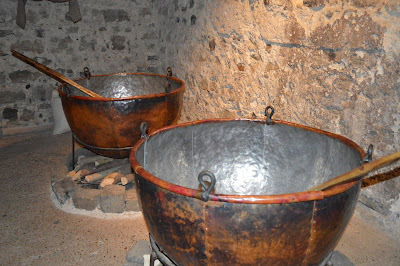 If, like me, you're something of a food historian, you'll be fascinated by the kitchens, complete with all the tools of the era. Whether you're grinding grain or butchering a hog for a royal feast, everything you need is here! What a feast I could make in these! After browsing the tower, a snack or lunch is in order. The NAAFI Restaurant was once used by the military folks stationed here and photos from WWII adorn the walls. Another stop while you're on the grounds should be Saint Mary in Castro Church. 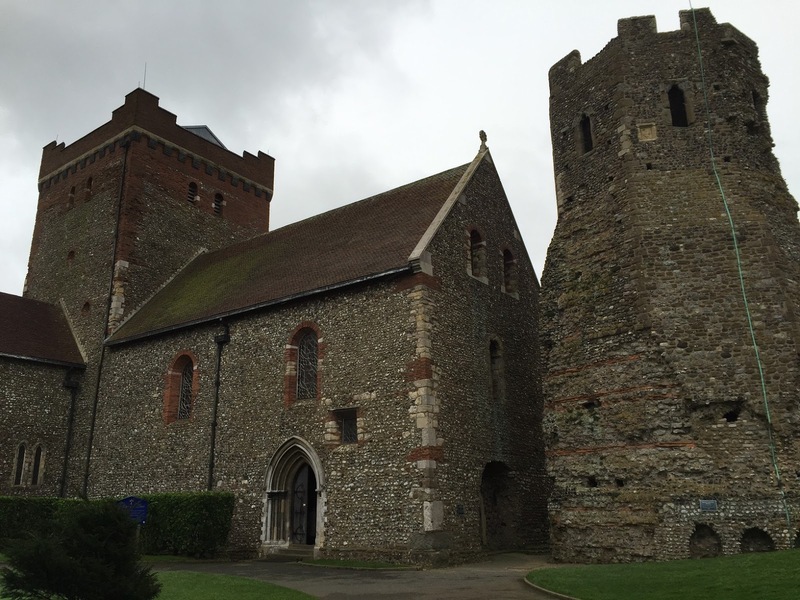 The small church actually predates Dover Castle, and still contains some Roman-era tilework. But if you're wondering why it looks a little more modern, it was largely rebuilt in the 1860s. Services are still held here. And next door to the church is a Roman lighthouse from the first century. Some parts of it were rebuilt in the 1400s but it remains an impressive sight, particularly when you imagine it lighting the way across the Channel for Roman ships nearly 2000 years ago. You can easily spend an entire day at Dover Castle (especially when the weather is a little more welcoming than it was the day we went). Enjoyed 'seeing' Dover through your eyes! Great article. Really good day but very windy! 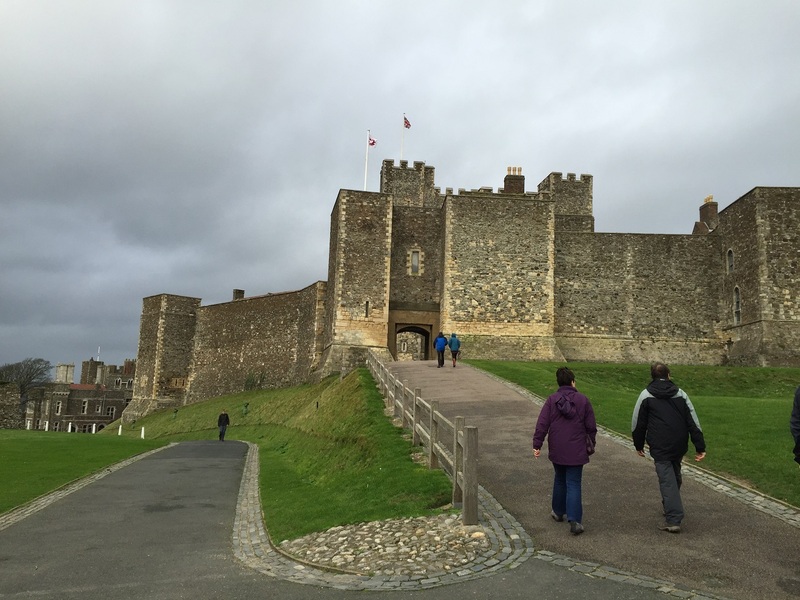 Hadn't visited Dover Castle for years, didn't realize there was so much to see & do.